Baseball is back. Well sort of. It's Spring Training and the boys are on the field and playing ball. If you missed it today, I don't know how you did, the San Francisco Giants played their first game of this year's Cactus League slate. They lost 9-4 to the Bay Area rival Oakland A's. Now I'm not going to sit here and read into this, or analyze that. No, today was the first day of Spring games and just having the promise of summer is enough. There's nothing to be gained from picking apart the game. 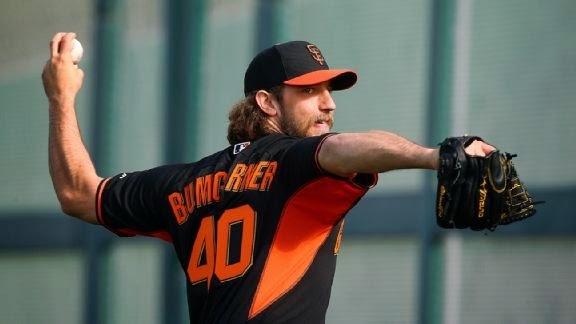 Did Madison Bumgarner give up 4 runs and 5 hits in his 1.2 innings of work? Yes. But Spring isn't results oriented and we all know that. I was impressed by the ovation Bumgarner received after Bruce Bochy lifted him for Brett Bochy during the bottom of the 2nd inning. The accomplishments of last season are enough to tide us over for now. I listened to the game on and off throughout the afternoon. Just hearing the voices of Jon Miller and Duane Kuiper was soothing for Giants fans everywhere. I know, I'm delivering some hard hitting analysis here. Who cares? Baseball is back and the Giants get to defend their title. Here's a quick list of the things I'll be watching for this March. - The battle for the 1 open bullpen spot. Will George Kontos stay with the team? Can Jean Machi repeat his early season magic of last season? - The backups on the bench. We know Gregor Blanco will be the 4th OF, but who's the 5th? Can Matt Duffy crack the infield behind Joaquin Arias? - Will the Giants decide to keep 3 catchers this season? Andrew Susac has shown he belongs so will he get a shot? Can Hector Sanchez rebound from an injury filled 2014? - Will Angel Pagan make it through Spring without injuring himself? Nah, just kidding, he waits until the regular season to do that. So we're back. Baseball is here and we can all rejoice in its wonderful goodness. The Giants are defending champs for the 3rd time in 5 years. Enjoy everybody, I know I'm a happy man today. Side note - I totally stole the name of this post from a Jackopierce song. Here it is below because, well, I love Jackopierce and this is my blog. So listen to it damnit! They are good if you like that sort of thing.